A good father of the groom speech should be personal, humorous and/or moving. 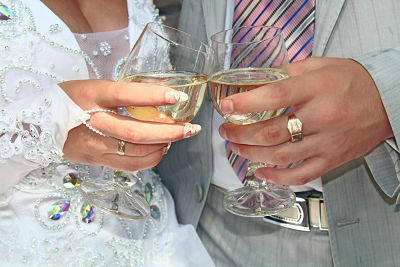 What makes THIS toast personal is the good and heartfelt advice that the father offers to the newly married couple. Even if the father's marital track record is not that good, a "lessons learned" element can be very poignant and appropriate if properly expressed. Use this example of a father of the groom speech as a guide for writing your own. As you begin to personalize the words given here, you may well be inspired with a few extra ideas of your own. Family, friends and especially Jen and Michael. I remember when Michael was born. I was so proud to be the father of that baby boy. I remember when Michael was captain of the basketball team in high school and his team won the state championship. I was so proud to be the father of that teenage boy. Today, I am proud to be the father of the man I see here, starting a family of his own and setting out on a great adventure with his beautiful new wife Jen. Jen, it has been a pleasure getting to know you over these last few years and I know that Michael knows how lucky he is to have you. We are thrilled to welcome you into our family and we are so happy to have the rest of your wonderful family here to celebrate with us. This is truly a joyous day! As you begin your life together as a married couple, I wonder if there is anything I can say to you that will be of value. Most of life is about learning along the way, through the experience of living. I have to say that I simply ignored most of the advice I received in my life until I found out through my own mistakes and experience that it was good advice. Michael, it seems like so far in your life you have been that way too. So, instead of offering advice today, I will make a request of you. I will ask you, Jen and Michael, to just keep loving each other. Today that is very easy for you and maybe it is hard to imagine otherwise but sometimes life does get busy and difficult and we can get distracted from what is really important. You have decided that your love for each other is important enough to make a lifetime commitment. Always remember that, even in the difficult times. Simply keep loving each other and your life will fall into place beautifully. Family and friends, let's raise a glass and toast to a lifetime of love and happiness for Jen and Michael! I hope this father of the groom speech has given you some ideas for one of the most important and memorable speeches a father will ever make. Check on back or subscribe to the blog to keep up-to-date with all the new offerings at best-speech-topics.com. 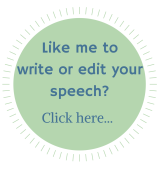 Click the like button above to let everyone on FaceBook know about this resource for speech topics, free sample speeches and speech writing tips! Or leave a comment in the box below and start a conversation! Click the like button and let everyone know! Best Speech Topics is a participant in the Amazon EU Associates Programme, an affiliate advertising programme designed to provide a means for sites to earn advertising fees by advertising and linking to Amazon.co.uk/Local.Amazon.co.uk/Amazon.de/de.BuyVIP.com/Amazon.fr/Amazon.it/it.BuyVIP.com/Amazon.es/ es.BuyVIP.com and is also a participant in the Amazon Services LLC Associates Program, an affiliate advertising program designed to provide a means for sites to earn advertising fees by advertising and linking to amazon.com or myhabit.com.